South Africa at the crossroad: continuing the democratic path? and democratic institutions are at least partly weak (Holden 2012: 95). belongs to the black middle class. 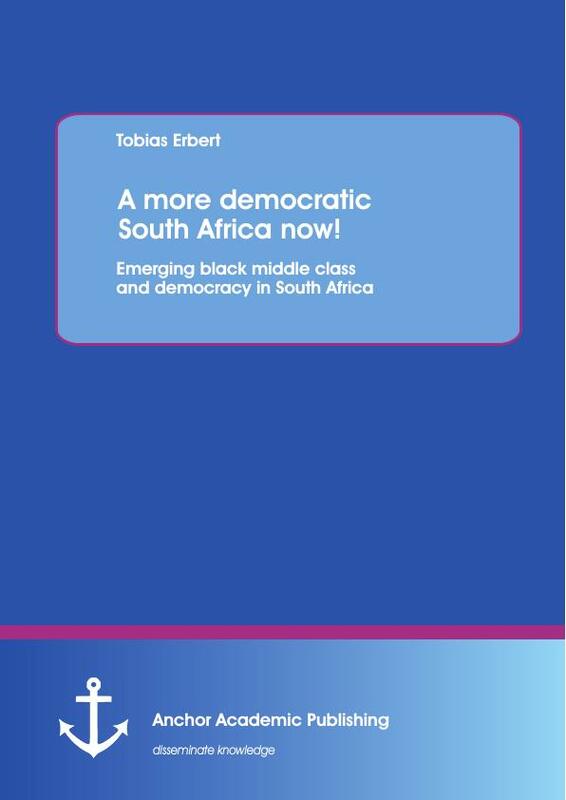 1) How does the emerging black middle class in South Africa understand democracy? the strengthening of democracy in the country? 1994 (Giliomee et al. 2001: 161-162; Southall 2005: 67, 73). black middle class can be a pillar of democracy. of the study and pointing to remaining uncertainties and areas for further research. some attributes that are part of a general understanding of democracy. each other in previous research. clear a priori definition criteria. which qualitatively distinguish themselves from other social classes" (Lu 2005: 164). professionals, associated professionals, technicians and clerks" (Visagie, Posel 2011: 6). university degree and are working in a white-collar profession. The terms black middle class and African middle class are generally used interchangeably. democracy might be limited only through its mere size. it is an essential concept throughout this study. set of characteristics which may be ranked in many different ways" (Lipset 1959: 73). influence major decisions by choosing among contenders for political office." of democracy based on the right to vote. of minorities is called a liberal democracy (Lu 2005: 167). achieve a certain degree of social inclusion (ibid. 2009: 272). law) and probably even a social dimension (basic material needs, social inclusion). linked to the development of a middle class that could moderate conflicts in society (ibid. 2005: 160) because it is assumed that "middle class individuals think and act democratically"
al. 2003; Southall 2004; Visagie, Posel 2011; Phadi, Ceruti 2011). black middle class as defined in this paper. His assertions just refer to "a core middle class" (ibid. 2005: 2) which is more similar to a black elite than an emerging middle class. of South Africa can be gained through a qualitative approach. behaviour or actions. Only "if politics becomes intense [...] because of some salient issue"
(ibid. 1963: 483), political attitudes might also result into the respective political behaviour. democratic system and realize its attitudes. class (see chapter 2.1) and could be seen as an ideal type of the defined group. middle class standard of living (Visagie, Posel 2011: 5). recording and the further use of the interviews for this paper. interviewer could have biased the responses of the interviewees (Diekmann 2010: 447, 466). difficult to rule out such distorting effects completely. almost anything is still methodologically possible under the label of qualitative research"
theoretical knowledge and is hence theoretically embedded. used to answer the first research question. The technique of explication refers to adding additional data to the self-collected data (ibid. and lines (l.) are given to indicate the exact position in the respective interview. middle class and democracy in South Africa. were only counted if they were introduced independently by the interviewee. "it [democracy] means being able to be anything I want without any restrictions"
"democracy must provide opportunities [...] that people have never had before"
agreed on a comprehensive support of affirmative action policies. relatively strong claim that is made for direct elements of democracy (C8). In terms of political liberties, specific attention is devoted to the freedom of expression. criticize the flaws of the governing ANC (C5, C26). dimension of democracy is seen as primarily essential to democracy. recent threats to the freedom of expression. 4.2) What kind of relation? strengthening democracy" (Giliomee, Simkins 1999a: 3). employment and the demographic transformation of the civil service (Holden 2012: 227). imply that it will be "unlikely to turn away from the party that had made its rise possible"
ANC and the emerging black middle class in South Africa. The relation is more complex. contributed but obviously [...] the last 19 years they sort of deteriorated"
public financial means that stunts the broadening of opportunities for disadvantaged people. of democracy (compare chapter 4.1). education is relatively high but decreases significantly with an academic level of education. university degree are in favour of one party rule. The percentage for group (f) is based on a very small number of cases (n=4). are in congruence with the qualitative data. groups (Afrobarometer 2010-2012). Generally, levels of support for one party rule are low. class in terms of approval to one party rule. conviction as due to a serious and electable alternative to the ANC. alternative is regarded as highly important. quantitative data (only four cases for post-graduates) and is probably not an empirical regularity. this study do not suggest such an interpretation. a profound demand for a serious opposition party to the ANC. benefits from the current shape of democracy. democracy, stressed the importance of a social dimension that is attached to democracy. affirmative action, employment equity, and empowerment policies" (Schlemmer 2005: 12). 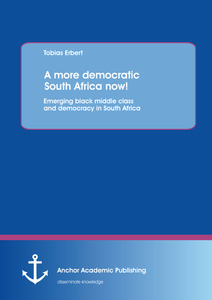 emerging black middle class primarily as a driver of a strong social dimension to democracy. electable alternative to the ANC. alignment of the black middle class with the governing ANC (Schlemmer 1999: 287-288; ibid. and democracy (Lipset 1959: 83; Barro 1999: 171; Easterly 2001: 330; Lu 2005: 171). being manifestly aligned with the ruling ANC. to forget that the middle class is not the only factor influencing the thriving of democracy. black middle class could come into effect. competition and its proneness to an alternative party apart from the ANC. additional methodological value and increase the general meaningfulness of the findings. could be an inspiration for more extensive research projects in the future. Afrobarometer (2010-2012): Online Data Analysis. Afrobarometer Round 5. 2010-2012. Barro, Robert J. (1999): Determinants of Democracy. In: Journal of Political Economy. Vol. 107, no. S6. P. S158-S183. Inkeles, Alex (ed. ): On Measuring Democracy. Its Consequences and Concomitants. Journal of Economic Growth. Vol. 6. P. 317-335. Overcome Africa's Challenges. Picador Africa. P. 71-98. Ernst; Steinke, Ines (ed. ): A Companion to Qualitative Research. Sage. P. 146-152.
ibid. (2012): Qualitative Sozialforschung. Eine Einführung. Rowohlt. Political Science. Oxford University Press. P. 1133-1165. Class. In: Holden, Paul; Plaut, Martin: Who rules South Africa? Biteback Publishing Ltd. P.
Paul; Plaut, Martin: Who rules South Africa? Biteback Publishing Ltd. P. 347-358. Development and Political Legitimacy. In: American Political Science Review. Vol. 53, no. 1.
ibid. (1960): Political Man: The Social Bases of Politics. John Hopkins University Press. Review of Modern Sociology. Vol. 31, no. 2. P. 157-178. Ernst; Steinke, Ines (ed. ): A Companion to Qualitative Research. Sage. P. 359-364. Mayring, Philipp (2010): Qualitative Inhaltsanalyse. Grundlagen und Techniken. Beltz. Hopkins University Press. P. 120-132.
between Scholarship and Politics. John Hopkins University Press. P. 13-37. Africa. In: African Sociological Review. Vol. 15, no. 1. P. 88-108. Porst, Rolf (2011): Fragebogen. Ein Arbeitsbuch. VS Verlag für Sozialwissenschaften. Middle Class in Democratic South Africa. In: Politeia. Vol. 22, no. 3. P. 6-29. Development and Enterprise. CDE Focus. No. 8. Randall, Vicky (ed. ): Politics in the Developing World. Oxford University Press. P. 264-274. Africa. In: Canadian Journal of African Studies. Vol. 38, no. 3. P. 521-542.
ibid. (2005): The 'Dominant Party Debate' in South Africa. In: Africa Spectrum. Vol. 40, no. 1. Stake, Robert E. (1995): The Art of Case Study Research. Sage Publications. Statistics South Africa (2011): Census 2011. Fact sheet. Ulfelder, Jay (2012): Worrying about South Africa. In: Foreign Policy.